Tomorrow night, Jeppe Jarnit-Bjergsø — the cult brewer behind Denmark’s Evil Twin — and Daniel Burns — who has worked at Noma and Momofuku Labs — will open the doors to Tørst, one of the most anticipated beer bars in years. Grub caught up with Jarnit-Bjergsø and Burns and got the lowdown on exactly what to expect. The space, designed by hOmE New York, is a composition of reclaimed wood, straight lines, and Scandinavian chairs from the sixties. 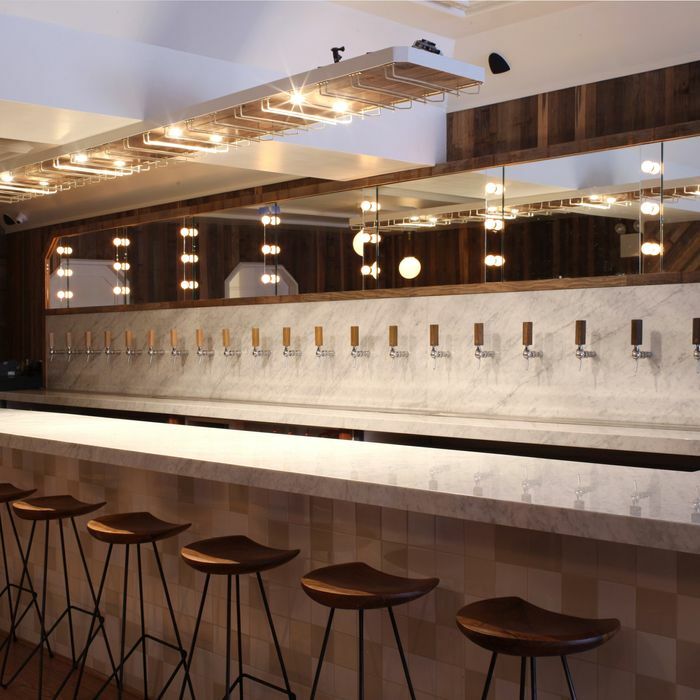 Behind the gorgeous marble bar is Tørst’s secret lodestar: the so-called “flux capacitor,” a red-lit, glass-enclosed control panel under the taps. 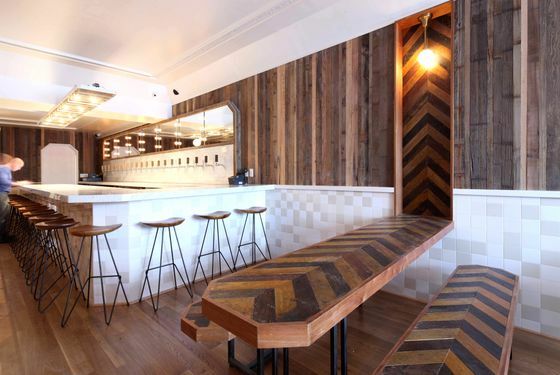 It was designed by Gabe Gordon, the chef, brewer, and owner of Beachwood BBQ in Long Beach. The flux capacitor allows the bar’s stewards to calibrate nitrogen and carbon dioxide mixes and adjust compression of each tap, “which means you can serve all beers absolutely perfectly.” It also employs a Glycol system, meaning beer can be served at four different temperatures: Imperial stouts and barleywines at 52, dry stouts at 48, IPAs at 42, and pilsners at 38 degrees, for example. • Two barleywines, called Tørst Front Room and Tørst Back Room. 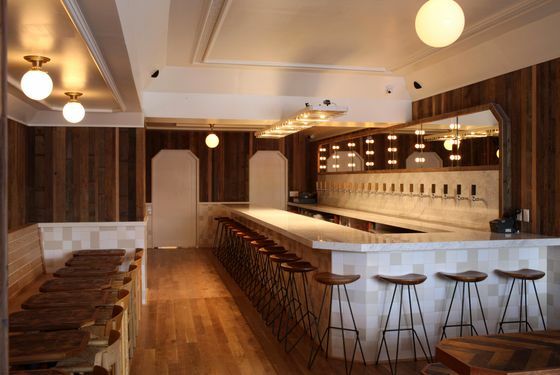 “Front Room is for the bar,” says Jarnit-Bjergsø, “and Back Room for the restaurant. They’re started from the same barleywine, sweet and malty, at 11.2 percent, but I aged each one differently in two different ways.” One is aged in port-wine barrels imported directly from Portugal, and the other in a barrel used to age Spanish fortified wine. • De Molen Rhythm & Blues and Hel & Verdoemenis 666 from Brouwerij de Molen. “They’re the best brewery in Holland,” says Jarnit-Bjergsø. • Chad Yakobson of Crooked Stave in Colorado brews “Brett” beer for the bar, which will be “very funky and sour” because of all that wild yeast. • The Stockholm, Sweden–based Omnipollo Brewery made a special beer for Tørst. The bar is also pouring the brewery’s Mazarin and Nebuchadnezzar. • An IPA from Beachwood BBQ in Long Beach, home of the original flux capacitor. “I’m trying to get a lot of my friends’ beers in here,” says Jarnit-Bjergsø. • The bar will pour some beers, including Mexican Cake, from Westbrook, the South Carolina brewery where some of Evil Twin’s beers are produced. Right now they only distribute to a few states.